The makers of M&M's have just released three new flavors — but there's only one that's really getting fans especially fired up: Mexican Jalapeño Peanut. "So down for this idea," one person wrote. "We want these!!" wrote another. But the sweets, which are coated in yellow and green candy shells, didn't elicit only positive comments. "Nah I'm good" and "For the love of all that is holy" were just two of the thousands of comments from people who reacted with concern or disgust to the news. The three new treats hit store shelves on Monday and, according to M&M's, they're all totally different. "The Mexican Jalapeño Peanut flavor combines just the right amount of spice with chocolate," the press announcement reads. "The Thai Coconut Peanut flavor is a savory sweet taste inspired by the tropics of Thailand. And there’s nothing more English than toffee, and the quintessential English Toffee Peanut flavor tastes as elegant as a trip to Great Britain itself." SAY WHAT?! The next M&M's vote is for "Internationally Inspired Flavors." The one flavor circulating the interwebs right now is Mexican Jalapeño Peanut. Yeah, I'd eat that. Edit: @snackchatlive has the scoop on all 3! The other two are English Toffee Peanut and Thai Coconut Peanut! 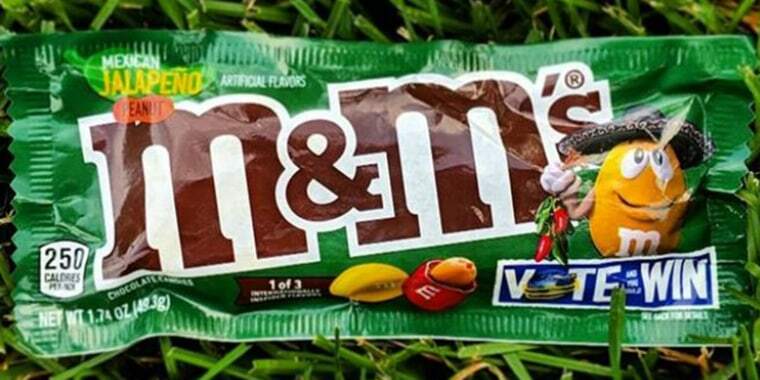 "The Mexican Jalapeño M&M's have the same classic crunch and milk chocolate flavor as traditional peanut M&M's, but with a very mild jalapeño flavor that kicks in after a few bites," Timm told TODAY Food. "They have a great, natural jalapeño taste, with just a subtle hint of spice. For all the snackers who are averse to spicy foods — don't worry! — these spicy M&M's won't have you calling the fire department, or guzzling a glass of milk." M&M's lovers will recall that a limited-edition spicy Chili Nut candy was released in 2016. "The new M&M's have a very distinct jalapeño flavor, but the spice factor, or 'heat,' is virtually identical to the chili flavor from years past," Timm said. "The English Toffee Peanut M&M's were my absolute favorite out of the three new flavors," Timm told TODAY. "The toffee flavor was incredibly bold and robust, with a delicious coffee and caramel essence. Highly addicting!" As for the Thai Coconut Peanut M&M's, Timm said that they "have just the perfect amount of coconut flavoring and that the combination of coconut and milk chocolate is a match made in heaven." Fans will be able to vote for their new favorite candy at www.flavorvote.mms.com, or text the word “vote” to 84444. By voting in the contest, candy fans will be entered for a chance to win a trip to one of the three countries that inspired the flavors. The contest is open through May 17. In 2018, Crunchy Mint beat out Crunchy Raspberry and Crunchy Espresso M&M's. While Timm has a feeling the Toffee Peanut M&M's will likely become the fan favorite, he doesn't discount the novelty of the Mexican Jalapeño Peanut M&M's. "The jalapeño flavor will definitely raise some eyebrows and attract the more 'adventurous' snackers, but I don't think they'll have enough appeal to become a permanent flavor," he said. M&M's will announce the winning flavor, which will be sold in stores for an extended period of time, in August. Until then, we'll be snacking on the M&M's TODAY's Hoda Kotb declared as "the best she's ever had."